1st Gear: Most energy experts expect about as much driving as during last year's Memorial Day weekend, the opening of the summer driving season, or perhaps a bit less. The average price for a gallon of regular nationwide is more than a buck higher than a year ago, although it slid about 6 cents over the last month, according to AAA's Daily Fuel Gauge Report. Higher gasoline prices of course usually mean drivers are less eager to take a drive. Take the 2007 Memorial Day weekend, for example. With a robust economy, Americans pumped nearly 37 million barrels of gasoline over that three-day weekend as prices at the pump averaged $3.20. Only a year later, with recessionary clouds looming and prices at the pump 69 cents a gallon higher, Americans pumped 6 percent less gas. We're thinking this year's weekend — despite the higher prices — will do better. And not just because we'll be back behind the wheel of a Jeep Wrangler for the first time in years. But if you want to save money this weekend in dino-fuel, here's our helpful list of ways to do it. 2nd Gear: The U.S. Transportation Department said yesterday it will propose making vehicle "black boxes," officially called event data recorders, or EDRs, mandatory in all vehicles by the end of the year. The plan was included in a 197-page Transportation Department regulatory reform proposal released by the White House this morning. "NHTSA plans to propose mandatory EDRs in all passenger vehicles in 2011," the Transportation Department said in the report. In a separate agency document posted on its website, NHTSA said it is also working on a proposal "for future enhancements to (EDRs) capabilities and applicability." We think by "future enhancements" they mean they'll add in a tracking system for the government's secret black helicopters. Seriously though, can we get more "nanny state" than this ridiculousness? 3rd Gear: According to results of the 2011 GMAC Insurance National Driver's Test, if required to take a written drivers' test today, nearly one in five licensed drivers would not pass. This translates to 36.9 million American drivers, or 18% of the country's total licensed motorists, who lack knowledge of some basic rules of the road - a conclusion that probably won't surprise many Jalopnik readers. For example, when asked what a motorist should do when approaching a steady yellow traffic light, 85% could not identify the correct action. Meanwhile, according to the survey, only 25% of respondents understood the concept of a safe following distance. This is why we created Jalopnik's "Rules of the Road." Maybe we need to create a printable pamphlet or something. 4th Gear: Chrysler is under investigation by the California Department of Motor Vehicles for operating a factory-owned dealership — Motor Village L.A., a 189,000-square foot store carrying the Chrysler, Dodge, Jeep, Ram and Fiat brands — in downtown Los Angeles in violation of state franchise laws. Although Chrysler bills it as a test bed for new retail and marketing ideas, it looks to me like it is a dealership. And since California law bars automakers from owning dealerships within ten miles of their franchised dealers — this looks like a slam dunk case of America's balkanized franchise laws allowing dealerships to stupidly win yet again. 5th Gear: Volvo, the traditionally safety-oriented automaker, is working to bring a kinetic-energy recovery flywheel tech system to its cars. They're joining Porsche and its GT3 R hybrid racer in the utilization of a kinetic-energy recovery system (KERS) that uses the energy of a flywheel spun to high speed by recovered braking energy to aid a car's engine during acceleration. See, when we think a giant flywheel spinning at 60,000 RPM underneath the rear passenger bench, we don't think safe. We think awesome. 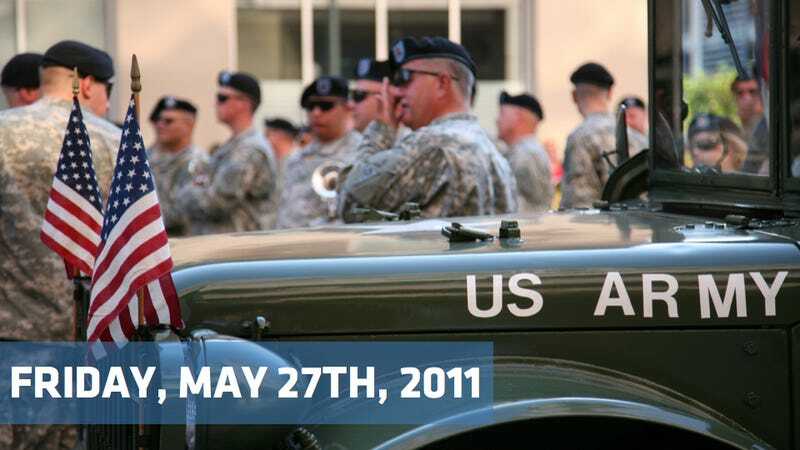 6th Gear: Quick Jalopnik programming note: Because of the holiday weekend, we'll be a little light on content this afternoon and Monday, as we celebrate our armed forces who've given their lives for this great nation of ours. Have a great Memorial Day and try to get outside with your car and enjoy any good weather you can get — we know we will. Tuesday we'll be back up and running with a fun story of what we did over the long weekend.